First, Cars kill more people than anything else. Period. Between 50,000 and 60,000 each year just in the USA. 911 was ~3,000. Big deal. In Y2K, it was estimated that the Economic Cost of Traffic Crashes was over $630 Billion USD. And the #1 cause of accidents? "Pilot" Error: Why not build a Sane car that doesn't depend on the driver? Bicycle cars Welding a pair of Bikes together to make a small car. A.K.A. 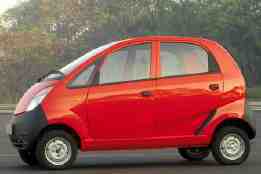 "the 2500 car" 10' 2" x 59" x 63"
Very nice, quick, light, pedal and electric power, regerative brakes. Not sold in the USA. No solar panels. 8' 8" x 48" x 48"
how it was built ^ Brilliant! Solar & pedal power. Never put in production. 9' x 27.5" x 52"? -30miles 2 main wheels, 2 small ballance wheels which retract in motion. ? 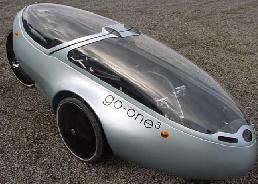 no regenerative brakeing steel chassis and frame with a fiberglass body and blown polycarbonate windshield. Enclosed cabin, rain and wind proof. 2 motors, pedals Solar: 8 amorphous silicon photovoltaic cells, 8% effecient, 22% more range. Available, well made, pedal with electric assist. Slow, no solar or regerative brakeing. 77" x 37" x ? to 108" x 55" x ? handlebars or butterfly steering wheel Hand operated. Standard drive; disc on left rear wheel. Positive traction, drum on left rear wheel. Optional rear brake on right rear wheel. not regenerative Jig welded, 2" square tube, powder coated. FAST! No longer in production, no solar or pedal power nor regerative brakeing. http://www.gemcar.com Global Electric Motor Cars 99x70x55"
rqriley.com/tri-mag.html 146-1/2" x 65" x 42"
Goldwing MC engine. 6 cylinder, electric start and reverse. 5-speed, constant mesh, return shift (MC transmission) Gasoline: 4.5g tank. rqriley.com/tm.html 146" x 67" x 45"
Rear: Independent semi-trailing arm Drum front & rear Custom welded. 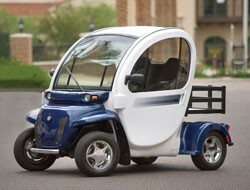 http://www.didik.com/criticalev.htm Very good overview / FAQ on electric vehicles. One critical passage (which I hope I can quote here without offending the author) is: "These batteries weigh more then normal car batteries and are designed to endure up to 2000 charges. Under normal conditions, this translates to about two years of use. A set of eight deep cycle batteries can cost as little as $800. 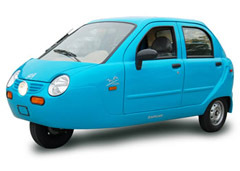 When the cost of replacing the batteries and the cost to recharge the batteries are considered, the cost to run a small electric car (non-hybrid) is about three times more than a conventional economy gasoline car. Since the cost of electricity tends to more or less follow the cost of fuel, it is unlikely that this ratio will change in the future. Electric cars are fun to have and drive, but you will not save money, nor will you really help the environment." The page then goes on to discuss how best to build an electric anyway. http://www.massmind.org/techref/other/bikecars.htm Welding a pair of Bikes together to make a small car. http://www.solartrike.com $20 plans, $3200 parts + Labor, $3700 prebuilt. 18 to 30? mph, <10 mile range. http://www.sunfrost.com/batteryless_car.html Using a 150 farad capacitor in place of a battery to start a standard gas engine (Ford truck in this case) "The capacitor does self-discharge after several days, however, it is easy to keep fully charged with a very small solar panel (about six inches square) even when parked in the shade. A major advantage of the capacitor as a starting device is its potentially long life and its use of more environmentally benign materials as the capacitor contains no lead. The principal ingredients inside the steel case of the capacitor are activated carbon and potassium hydroxide. This mixture could be easily neutralized by a weak acid such as vinegar."